In the United States, a state is a constituent political entity, of which there are currently 50. Bound together in a political union, each state holds governmental jurisdiction over a separate and defined geographic territory and shares its sovereignty with the federal government. Due to this shared sovereignty, Americans are citizens both of the federal republic and of the state in which they reside. State citizenship and residency are flexible, and no government approval is required to move between states, except for persons restricted by certain types of court orders (e.g., paroled convicts and children of divorced spouses who are sharing custody). Four states ( Kentucky, Massachusetts, Pennsylvania, and Virginia) use the term commonwealth rather than state in their full official names. Another enumerated congressional power is its power is its taxing and spending power. An example of this is the system of federal aid for highways, which include the Interstate Highway System. The system is mandated and largely funded by the federal government, and also serves the interests of the states. By threatening to withhold federal highway funds, Congress has been able to pressure state legislatures to pass a variety of laws. [ citation needed] An example is the nationwide legal drinking age of 21, enacted by each state, brought about by the National Minimum Drinking Age Act. Although some objected that this infringes on states' rights, the Supreme Court upheld the practice as a permissible use of the Constitution's Spending Clause in South Dakota v. Dole 483 U.S. 203 (1987). The borders of the 13 original states were largely determined by colonial charters. Their western boundaries were subsequently modified as the states ceded their western land claims to the Federal government during the 1780s and 1790s. 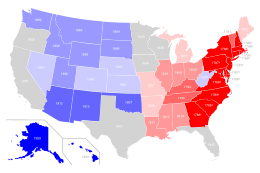 Many state borders beyond those of the original 13 were set by Congress as it created territories, divided them, and over time, created states within them. Territorial and new state lines often followed various geographic features (such as rivers or mountain range peaks), and were influenced by settlement or transportation patterns. 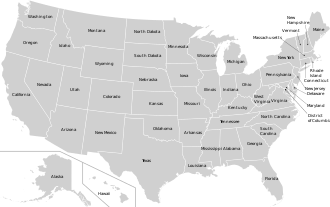 At various times, national borders with territories formerly controlled by other countries ( British North America, New France, New Spain including Spanish Florida, and Russian America) became institutionalized as the borders of U.S. states. In the West, relatively arbitrary straight lines following latitude and longitude often prevail, due to the sparseness of settlement west of the Mississippi River. Once established, most state borders have, with few exceptions, been generally stable. Only two states, Missouri ( Platte Purchase) and Nevada, grew appreciably after statehood. Several of the original states ceded land, over a several year period, to the Federal government, which in turn became the Northwest Territory, Southwest Territory, and Mississippi Territory. In 1791 Maryland and Virginia ceded land to create the District of Columbia (Virginia's portion was returned in 1847). In 1850, Texas ceded a large swath of land to the federal government. Additionally, Massachusetts and Virginia (on two occasions), have lost land, in each instance to form a new state.